People with schizophrenia are volunteering for a European research project to help the control and perhaps even silence the tormenting voices in their heads by confronting a computer avatar of themselves. Schizophrenia is a psychiatric disorder that affects around one in 100 people worldwide. Its most common symptoms are delusions and auditory hallucinations, or hearing voices. Mehdi Hafis was 23 when he was diagnosed with the condition. A former restaurant worker, Mehdi had to stop working because of the powerful side effects from his medication. Now, four years after the diagnosis, he struggles to have a normal life. He explained that he knew that he life was going to change for the long-term, and he understood he was not going to be able to do what everybody else could do. Medhi is one of 40 patients volunteering at a psychiatric hospital in the south of France for a European research project aimed at providing innovative therapies to sufferers of social pathologies like schizophrenia. The first stage in the therapy is for the patient to create a computer-based avatar by choosing a face and a voice for the entity they believe is talking to them. “We create avatars that are very similar to the patients,” explained Robin Salesse, human movement scientist for Euromov at Montpellier University. “But we also play with the similarity of the movements and behaviours. That’s why we put sensors on the patients to capture their movements. This way we extract individual motion signatures from each patient that will then be implemented into their own avatars”. Neoroscience suggests it’s easier to socially interact with someone who looks like we do. 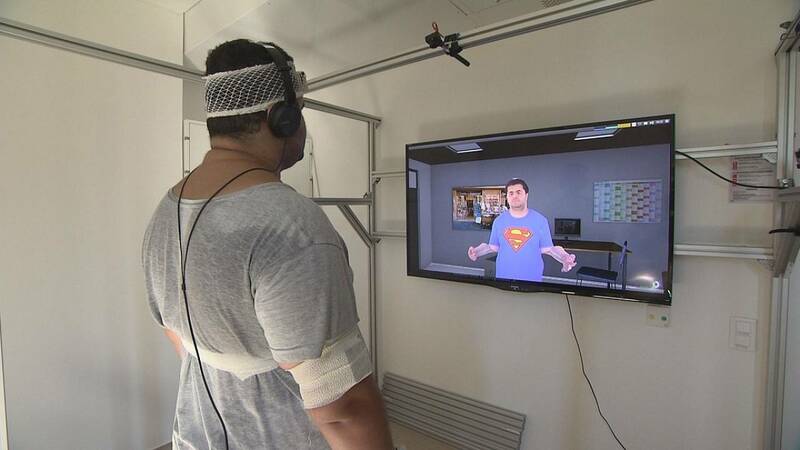 Body scanner technologies, motion tracking systems and complex mathematical models were combined to develop avatars that were relevant and realistic. “The methodology and the algorithms are very, very general,” Krasimira Tsaneva-Atanasova from University of Exeter told Euronews. “They can be used to look at similarities and dissimilarities in the patterns of movements. They can be also applied to groups or to individuals. They can be applied to healthy or pathological conditions. That is the beauty of mathematics”. Researchers say the way forward is to develop a technology that is more reliable, efficient, adaptable and also more affordable; something that can be easily used by patients at home.